Here is my already favorite iPhone app and I just downloaded it. The St. Josemaría iPhone App! The first iPhone application with Saint Josemaría Escrivá teachings, life and catholic prayer devotions. Saint Josemaría Escrivá, the founder of Opus Dei, opened a new path of holiness in the Catholic Church, teaching that people can become holy by performing their work and daily duties with a Christian spirit. Opus Dei is a Catholic institution founded by Saint Josemaría Escrivá. Its mission is to spread the message that work and the circumstances of everyday life are occasions for growing closer to God, for serving others, and for improving society. Opus Dei complements the work of local churches by offering classes, talks, retreats and pastoral care that help people develop their personal spiritual life and apostolate. Opus Dei has a YouTube channel now. The Opus Dei Office of Information has created the Saint Josemaría channel to make the founder’s life and teachings better known. 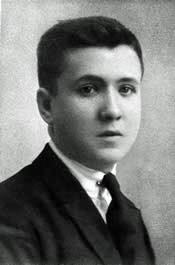 It offers many hours of videos of Saint Josemaría Escrivá. People from all over the world have the opportunity to listen to someone who is now in heaven speaking on about God. Here’s an example of one of the videos already posted. This one is about The Way. There is a movie being made that will focus on the life of St. Josemaria Escriva called “There Be Dragons.” Not sure when/if it will actually be released. This is a press photo (by Michel Lichtenstein) they’ve released from the shooting of the movie which was done in Argentina and Spain. A young journalist long ago rejected by his now aged and dying father finds himself investigating one of his father’s former friends, a candidate for canonization. 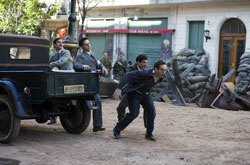 Uncovering the two men’s complicated relationship from childhood through the horrors of the Spanish Civil War unveils a compelling drama filled with passion, betrayal, love and religion. An action packed story set during a murderous time in history that ultimately serves the present by revealing the importance and timeless power of forgiveness. In the production notes it says that the movie is, ” woven around the figure of St Josemaría Escrivá in his childhood and his early priestly works during the Republic and the Spanish Civil War.” Charlie Cox plays Josemaria. We’ll need to keep our eye out for the release. You can also read about the movie on IMDb, the Internet Movie Database. The website that focuses exclusively on St. Josemaria Escriva has been updated. The new website on Opus Dei’s founder—available in eight languages—makes it possible to gain more ample knowledge of his life and his message about seeking Christ in one’s daily activities. The contents of http://www.josemariaescriva.info/ are organized under six major headings: the life and teachings of St. Josemaría, personal testimonies, educational and social initiatives inspired by his preaching, documents, multimedia, and current news. A movie is being made about the life of St. Josemaria Escriva. I’m guessing that this will be a very different look at Opus Dei and its founder than that sensationalist but from what I understand poorly made movie that got so much attention. Here’s some information about the movie from the Catholic News Agency. The film “There Be Dragons” is a film set during the brutal Spanish Civil War in the second half of the 1930s, Catholic San Francisco reports. It is expected to be released in summer or fall 2010 and has a budget of about $30 million. Joffe also wrote the screenplay for the film. He told an August 23 press conference that he has creative freedom over the project and had earlier rejected an offer to film an Opus Dei-provided script. There is a new series starting on EWTN beginning Sunday, August 30 that will focus on Opus Dei and its founder, Saint Josemaría Escrivá. The program consists of 13 parts. Pictured are co-hosts, John Coverdale, Seton Hall law professor and Damon Owens, founder of Joy-Filled Marriage. Chelsea tells me Damon is a Theology of the Body speaker. BTW, she does a weekly post on her personal blog about Theology of the Body and has a blog devoted to it as well. Each segment will consist of a half-hour interview. One segment will be broadcast each week and will be shown in the United States and Canada three times during that week: Sunday at 5 p.m., Tuesday at 3:30 a.m., and Friday at 10:30 p.m.
Damon Owens, from New Jersey, is the host-interviewer for the series. He has appeared in various other EWTN programs. His co-host is John Coverdale, author of Uncommon Faith, a book about the early history of Opus Dei, series. Coverdale worked in Rome from 1961 to 1968 with Saint Josemaría. Among the other guests in the series are Newark Archbishop John J. Myers, who discusses the role of Opus Dei in the Church; Olga Marlin, who helped start Opus Dei in Kenya; and Terry Hurson, a New York City police officer, who explains how Opus Dei’s spirit has helped him in his work. 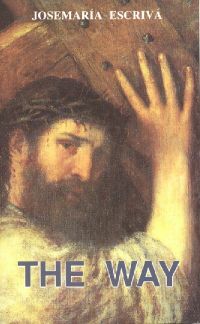 The very first book by St. Josemaria Escriva that I read was The Way. That is still my favorite book of his. It contains many inspirational thoughts that anyone would find helpful in their spiritual meditation on a daily basis. The book was first published in 1939. This year marks the 70th anniversary of the 1939 publication of St. Josemaría’s spiritual masterpiece, The Way. It has been and remains a source of inspiration and spiritual growth for millions of people all over the world, having sold over 5 million copies in 50 languages. I purchase copies from Scepter Publishers and you can also find a copy on Amazon.com as well. 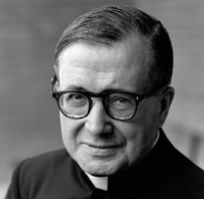 Today is the feast day of St. Josemaria Escriva, founder of Opus Dei. It is the anniversary of his death in 1975. This is a photo of him from the early 1920’s before he even became a priest. Many Masses are being celebrated in his honor today and you can find a list of many of them here. I had the honor and opportunity to attend the cannonization of St. Josemaria in 2002. 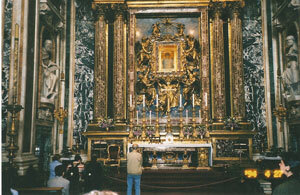 This is a photo of his casket which was displayed in various locations during the days prior to the ceremony in front of the St. Peters Basilica. I can’t tell you how much the spirituality taught by St. Josemaria via Opus Dei has meant to my life. It’s such a simple thing, to live out holiness in the everyday world. But I realize how difficult it is in our world and culture and that’s why having a plan of life is so important. This is me on the day of the cannonization ceremony with my headphones on to listen to the english translation of the ceremony and Mass. The crowd was unbelievably huge and went on as far as I could see. These are scans of my photos from then since it was pre-digital photography for me. I have also had the honor to meet then Pope John Paul II and this was just one of a number of occasions when I was able to see him and how well loved he was by so many. 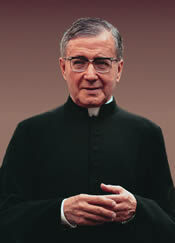 St. Josemaria please pray for me and thank you for everything. We’re getting closer to the 26th June, the anniversary of Saint Josemaría’s death in 1975 and which is now his feast day. In case you’d like to celebrate it in a very meaningful way you can find a couple of listings of Masses in his honor. There’s one on the Opus Dei website and you can also find one on the St. Josemaria Institute website. I completely missed seeing the announcement of a day long conference on the life of St. Josemaria Escriva which will be taking place in McLean, VA on April 4th. Appropriately named the “St. Josemaria Conference,” it is being held to celebrate 60 years of Opus Dei in the United States and 80 years in the Church. You can find registration information, program and list of speakers on the website. Today is the feast of St. Joseph the worker who is an excellent model for Opus Dei. He was regarded in the Bible as a good and just man and was referred to by his profession (“is this not the carpenter’s son?” Mt. 13:55). The emphasis on Joseph’s work in the Bible and throughout tradition speaks to the importance of our own work in the world. Be sure to read today’s reading from the Divine Office which comes from Gaudium et Spes n. 33-34 on Man’s Activity Throughout the World. -Work is man’s original vocation. It is a blessing from God, and those who consider it a punishment are sadl mistaken. The Lord, who is the best of fathers, placed the first man in Paradise ut operaretur, so that he would work (Furrow 482). -I ask God that you may take as your model Jesus as an adolescent and as a young man, both when he disputed with the doctors in the temple and when he worked in Joseph’s workshop (Furrow 484). -Before God, no occupation is in itself great or small. Everything gains the value of the Love with which it is done (Furrow 487). -Heroism at work is to be found in finishing each task (Furrow 488). -Let us work. Let us work a lot and work well, without forgetting that prayer is our best weapon. That is why I will never tire of repeating that we have to be contemplative souls in the midst of the world, who try to convert their work into prayer (Furrow 497). -Sanctifying one’s work is no fantastic dream, but the mission of every Christian – yours and mine. You cannot sanctify work which humanly speaking is slapdash, for we must not offer God badly-done jobs (Furrow 517, 493). -From St. Paul’s teaching we know that we have to renew the world in the spirit of Jesus Christ, that we have to place Our Lord at the summit and at the heart of all things. Do you think you are carrying this out in your work, in your professional task (Forge 678)? -Professional work – and the work of a housewife is one of the greatest of professions – is a witness to the worth of the human creature. It provides a chance to develop one’s own personality; it creates a bond of union with others; it constitutes a fund of resources; it is a way of helping in the improvement of the society we live in, and of promoting the progress of the whole human race…For a Christian, these grand views become even deeper and wider. For work, which Christ took up as something both redeemed and redeeming, becomes a means, a way of holiness, a specific task which sanctifies and can be sanctified (Forge 702). -You should maintain throughout the day a constant conversation with Our Lord, a conversation fed even by the things that happen in your professional work. Go in spirit to the tabernacle…and offer to God the work that is in your hands (Forge 745). This past week my Opus Dei Cooperator’s Circle met at my house. With all my travel I rarely get a chance to attend so I try to host at least once a year and then maybe I’ll actually make it. Be uncompromising in doctrine and conduct. But be yielding in manner. A mace of tempered steel, wrapped in a quilted covering. Be uncompromising, but don’t be obstinate. This is what I love about this saint. His spirituality is so simple and he puts it into simple words for us to understand and apply in our life. I think this is a great lesson to meditate on. When St. Josemaria was a young parish priest, there was a milkman who entered his Church every morning for a few seconds. â€œJesus, here is John the milkman.â€ To the young priest, that prayer seemed simple and beautiful. Here’s where you can find the video. On the occasion of the 5th anniversary of his canonization, we offer a weekly video of Saint JosemarÃ­a. 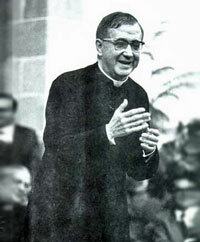 In the last years of his life, St. JosemarÃ­a held many conversations with various groups of people. During them, he would explain points of Christian doctrine and Opus Deiâ€™s spirit. These short videos allow you to see and hear him presenting these teachings. I hope your spanish is good. Are You Passionately Loving The World? As our business has grown I’ve found it more difficult to take time for daily devotions such as morning and evening prayer and spiritual reading. However, I believe that they’re even more important in my life than ever before. It’s nice to be making a good living but you have to question why you’re doing it. Why do I work so hard? Hopefully it’s to fulfill God’s will. Since I became a Cooperator of Opus Dei I have learned how we can turn the most ordinary things we do into part of our daily prayer. For example, one of the first things I try to do each morning is offer all my “prayers, works, joys and sorrows” of the day to God. Then I’ve got kind of a head start on my goal of praying constantly. St. Josemaria Escriva has helped so many people change their lives by finding meaning in everything we do. There’s a great video produced by the St. Josemaria Institute which you can order that helps show how you can achieve this kind of fulfillment in your daily prayer life by using examples of how other ordinary people have done so.